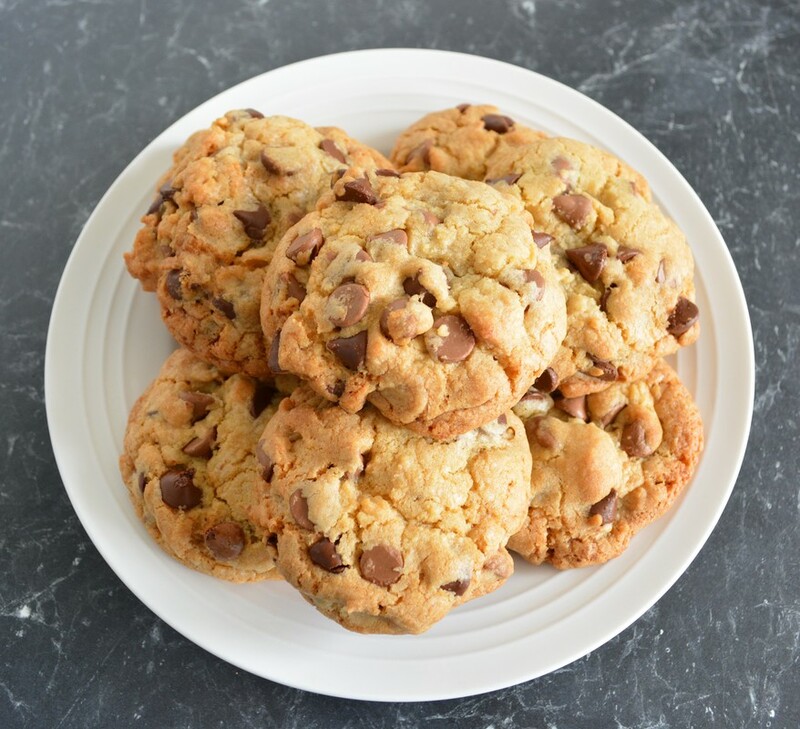 It has taken me years of trying different recipes to find the best ever chocolate chip cookie, but I have finally found it. These are amazing, they have a softness in the centre, but an edge that is crisp. They are chunky, every choc chip put in it has kept its shape and did not sink to the bottom of the cookie. The recipe states milk choc chips, I used dark, they were great, so I assume you can use whichever you prefer, or a combination of any choc chip. In the past the cookies I have made have been too sweet, were flat and unappealing to look at, were too crispy. You would think it was easy to find the perfect recipe for a cookie but it has not been. And then I read a recipe in a Nigella Lawson cookbook, she is amazing. What I found the most interesting was her introduction, she also for years could not get the 'simple' cookie right, but I am so glad she has. After loving her Totally Chocolate Chocolate Chip Cookies, I now also love her Chocolate Chip Cookies. The cookies will keep in an airtight container for 5 days. 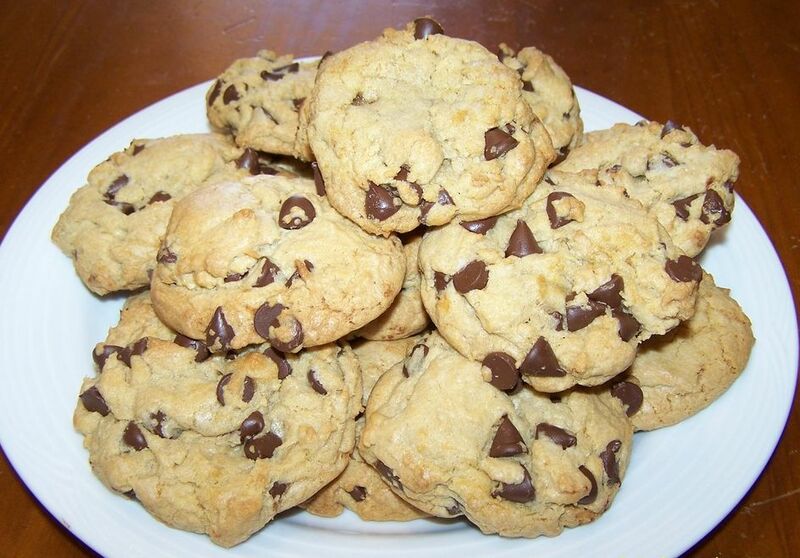 Baked cookies can be frozen, defrost for 2-3 hours at room temperature before eating. Unbaked cookies can be scooped onto baking paper lined trays as if you were going to bake them, freeze until solid. Then you can place them in resealable bags and freeze for up to 3 months. Bake directly from the freezer, no need to thaw, just add 2-3 minutes to your baking time. You can also keep them refrigerated unbaked for up to 3 days and bake as needed. I will never look for another cookie recipe again. These are perfect. Preheat the oven to 170C/150C fan forced. Line a baking tray with baking paper. Melt the butter and allow it to cool slightly. It is important to let it cool as if you don't it doesn't beat well with the sugars. Once the butter has cooled slightly, add the brown and white sugars to a large bowl, pour over the butter and beat them together. Add the vanilla, cold egg and cold egg yolk. Beat until the mixture is light and creamy. Using a spoon, stir in the flour and bicarbonate of soda into the butter mixture. Add the choc chips and fold them into the mix until well mixed. If your dough is too soft, this can happen if the butter wasn't cooled enough, place your cookie dough in the refrigerator for 5 minutes to firm up. Once firm, place ice cream scoop sized mounds on the prepared baking tray. (You can make them smaller if you prefer). You do not need to roll them into balls just place rough mounds on the tray about 8cm apart, as they will spread. 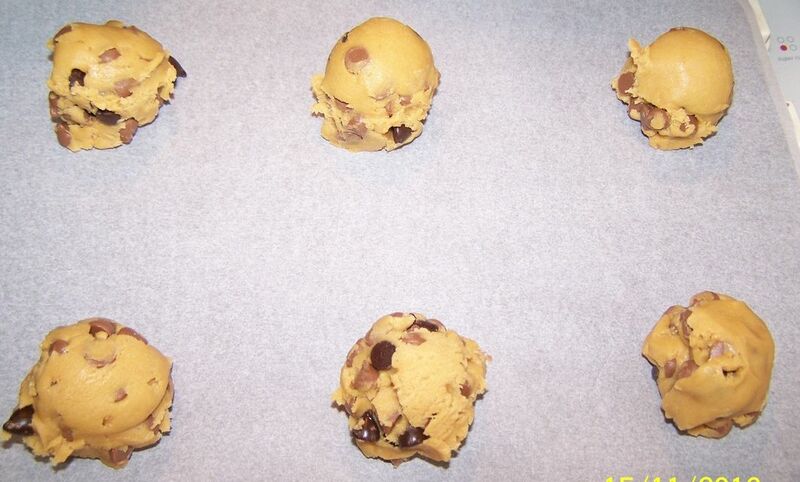 While one batch is baking, refrigerate the cookie dough not being used. Bake for 15-17 minutes for smaller cookies, 20 minutes for larger cookies, or until the edges have browned. Cool on the baking tray for 5 minutes, before transferring to a wire rack to cool completely.